4 OF 5 COUNCIL SEATS! This was written by admin. Posted on Wednesday, November 7, 2018, at 6:20 am. Filed under Uncategorized. Bookmark the permalink. Follow comments here with the RSS feed. Post a comment or leave a trackback. Sorry for the delay in reporting. Trip from Hampton to New Jersey ended up taking 12 hours and I didn’t get to bed until after 1:00. Can’t be more happy about this big win. Congratulations guys and thank you. Thank you admin!!!! Your tireless efforts to inform the public definitely contributed to this win, no doubt. Hopefully fairness and ethics may return. Thank you Dave! 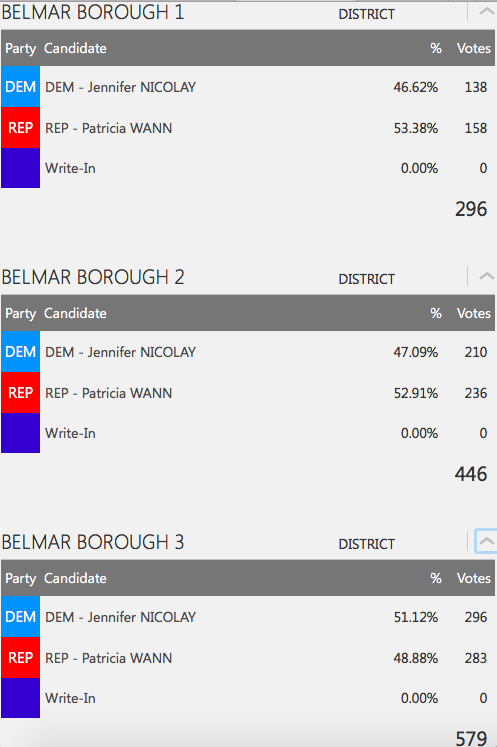 A big win for Belmar. May the future be bright for all. Just goes to show you how truly people were disappointed with the current regime. Congrats to our newly elected, please bring us some civility and honestly. To the losers, go live in your swamp, you deserve it. I’d love to go back and visit my former coworkers and celebrate with them! And to let Colleen know that her days of treating people with such disrespect are over. Congratulations to the winners. 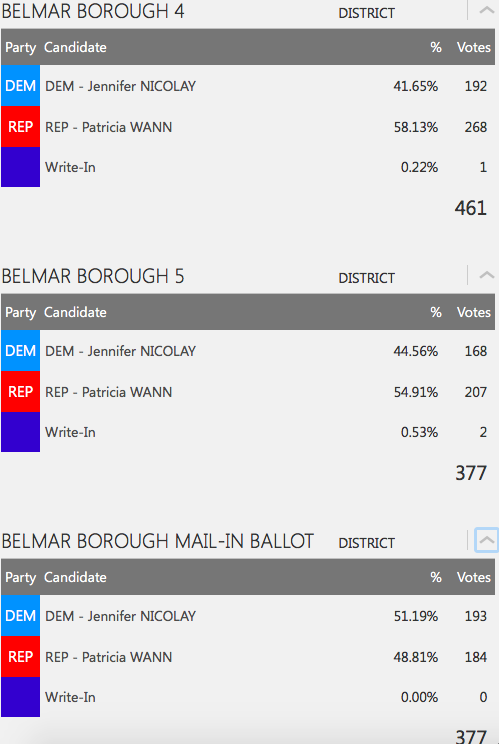 The newly elected and the people of Belmar, who I pray will be the ultimate winners. Should be very interesting since the Democrat machine, the appointed ones will respond like any deep state.I don’t know about tenure and all, but key to getting the town back on the right track is the replacement of the actual Mayor these past 6 years, Colleen Connolly. I look forward, as one of her victims, to this election having true consequences. Then there’s a certain direrctor of tourism. Nice work Mark, Pat, and James. Please don’t forget what the voters elected you to do.And please don’t forget why Jen and Brian no longer have those positions. Serve the people of Belmar, don’t let the power go to your heads, don’t dismiss or disrespect those that disagree with you, don’t use your new position to enrich yourself at the expense of the tax payer, and don’t allow outside interests to exploit what we have here. First order of business : DRAIN THE SWAMP: The Queen of Mean, Cone Man, DPW miscreant, Dockmaster Wannabe Fabio, Lifeguard supervisor…..can Belmar get an “AMEN” let’s look to the future and learn from the past….. Very curious why D’jais wasn’t backing a candidate in this election?? The real question is why did anybody vote for the DEMOCRATS. 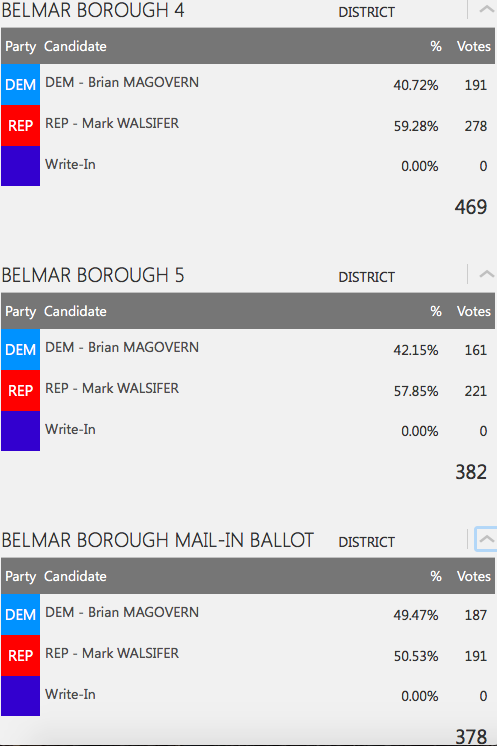 Must mean those voters are still living in Belmar? Maybe not all but most? No.1 … Everybody is replaceable. I predict hippie plastic bag man will resign from the council within a year, citing personal reasons. Personal reasons being he won’t be allowed to continue disrespectfully searching his laptop while ignoring what the residents of Belmar have to say at meetings. I sincerely hope our Reps. consider appointing Katrina to Mark’s vacant council seat. She deserves it and would do an excellent job in bringing this town back on it’s feet. #7…hopefully the current administration ends on a good note, meaning they make the right decision on the CFO position. Colleen has ZERO experience and just wouldn’t be the right fit. #12 – I agree completely with your idea to put Katrina in Mark’s chair. On the other hand though, I’d think it would be a good idea to put Mark Levis in Tom Brennan’s seat if he does resign as you think he will. Mr. Levis is a cut above the other democrats I think. 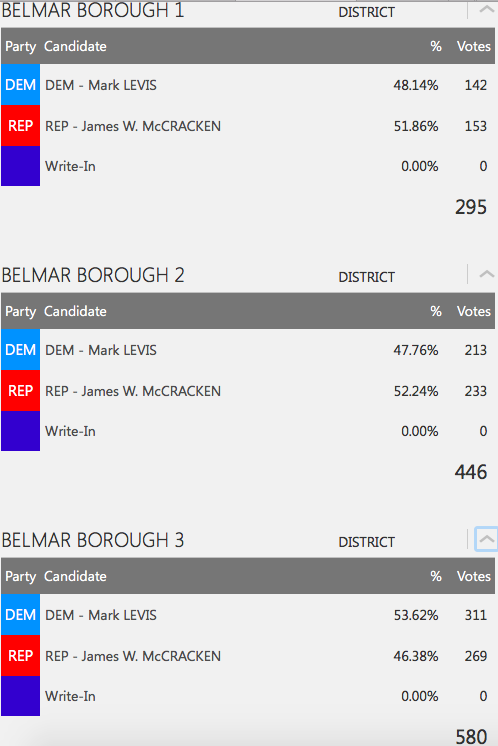 Please, please, please keep Belmar out of the papers,TV,social media,etc. Back to just a small, great, family oriented town. #7 Magovern–Seriously???? Seems like you and Colleen should have taken your own advice! It should have been recognized LONG ago that Colleen was bad for business and bad for the town, but instead Matt, you and Jen catered to her and allowed her to destroy your administration. Mark and his team know what lies ahead for them, and I don’t think you have to worry about any of them becoming like your administration. #13 I agree with you and hope that Mr. Magoo ends on a good note and does NOT give Colleen a position she is NOT qualified for with no experience. I have heard there are a few other applicants who have a lot more experience and would serve the town of Belmar better. Lets keep our fingers crossed that this election showed exactly what the residents want and that’s CHANGE all around! Who in their right mind wants her dirty hands handling ANY money!!! #16 that wasn’t McGovern. It was supposed to read mcgOVERn but it changed to all caps. I agree tho that they should have seen this coming. The advice was for the new administration from a supportive voter. I want them to be great and I think they will be. Congratulations to Mark, Pat and Jim!! I know that this is a team that Belmar has sorely needed for quite a while. I know that they will bring this town back to the way that I fondly remember it. I hope that Brian will do one last good thing for the town before he leaves…giving the CFO position to a person that will be good for the town…NOT Colleen. I will be happy to see her leave and take her Merrymakers with her. Let’s get back to what is important for Belmar…not all this “pay to play” that happened under Doherty and Connelly. Let’s get our beach back to the way it was…that is the bread and butter of this town. This requires good leadership which we had but was let go for “moving in a new direction”…which proved to be DOWN. People that grew up in this town know what it needs…not people that come in just to make changes that are only good for their careers and pockets…not really caring about the town. I know that Mark and his team will clean up their mess and bring back the Belmar we all remember and miss. #18–thanks for the clarification!! I agree that they’ll be great!! Victory is sweet. I look forward to Belmar returning to its former glory before the Queen of Mean and her insidious ways ruined the town and the beach. YO i aint no it be an ELECTION. Dye shudda TOLD da HOMIE – got free DRINKZ an voted 5X to. regarding the CFO position … I am unaware of any “full time” employee requirement. Per Diem or shared service is fine. #21 You are leaving out the king culprit. Doherty is responsible ultimately. Hopefully he has no hidden deals that Magovern will have to implement before the end of the year. Like with Brandywine, for example. Gee I hope Murphy doesn’t find out about this Republican victory. Lesson learned here for McGovern, Nicolay, Connolly and Brennan (next election). Dont “F” with the Belmar Beach Patrol! #25 We have to thank the Gov. for getting Doherty outta Belmar. As far outta here as he can get, that is. 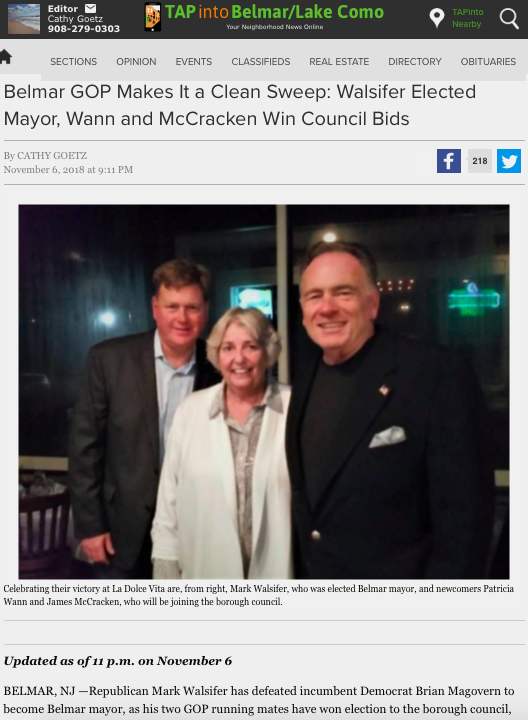 ….to be the loser of the mayoral race. The time has finally come. Instead, the others pay for their twisted loyalty to him. Hope they still get to go to his lagoon parties. He couldn’t care less about Belmar so I wouldn’t count on him caring about the people he used to get where he is now. As for us (Belmar) we are liberated!!! How 4 of 5? There’s 3 of them. Now….It’s time to get to work An above average effort. CONGRATULATIONS TO THE 3 OF YOU. #29 Walsifer has to appoint someone to fill the council seat that was left empty by his winning as mayor, presumably a Republican. #29- 4 of 5. Walsifer mayor, Pat, Jim and Katrina council. When Brennan resigns, Bean to fill his spot. Life is wonderful again in Belmar. And now lets get started on repairing all the damage the Dems. have done. The Belmar Touism Commission has been running itself against the Belmar ordinance that established it in the 1990’s. First, the number and diversity of members. The ordinance does not allow for “a paid director” to run things and vote. Nor does it allow for a council member to have a seat and vote. All present members have remained like Frank Sementa of D’Jais for years. They have continually used the tax from businesses to purchase things non-tourism like police equipment. Does anyone feel that we should continue to pay Mary Brabazon over $85,000 with benefits a year to get more crowds in Belmar? The very person who in retaliation placed a port-a-potty on the Desanctis Lawn. #32 May I suggest Jim Bean. He is an ex council person and would fit in nicely. An above average choice. #34…I know for a fact that Mary had nothing to do with the placement of the port-a-potty. It went way beyond her control. Cooleen the Cruel made the ultimate decision and Campbell took the fall. #34 Mary is a nice person but she always played both sides of the fence. We don’t need anymore people coming to town, we have enough. 85k seems way too much. As a proud card-carrying member of the “element” and someone who spent years trying to formulate THE Messaging that would bring down Goliath, I find myself laughing that the winning message ( accept for District 3 ) came down to the beaches and lifeguards. Simple but powerful ( timing just right ) For all those tireless and caring folks I worked with, we obviously overthought it. Sure you need good candidates. Republicans have had many a good candidate. After 6 long years and elections, it was the beaches, stupid! The beach is the crown jewel of any town along the jersey shore. When you have people in charge who have no idea how the beach is run and guarded, and their petty political moves and overreach disrupt the way things have been for 50+ years, it embarrasses the locals. 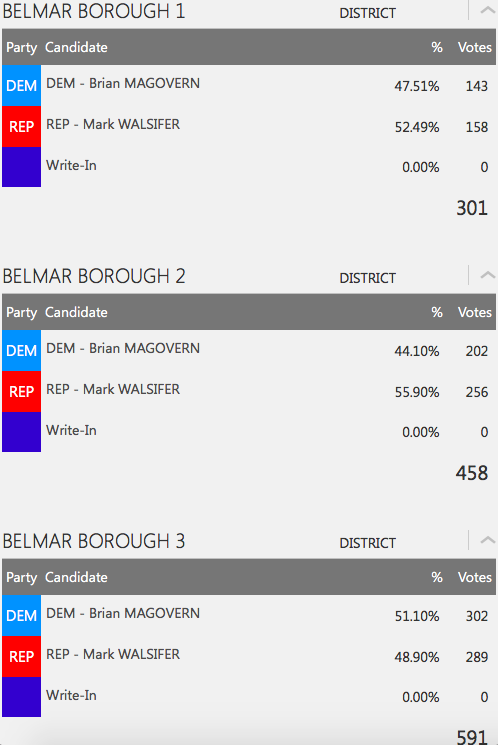 The people of Belmar spoke and the remnants of the Doherty Administration got what they deserved. Lets just hope the swamp continues to be drained…. It’s the beach, not new beach, the ancient beach in the New World that peop!e want to enjoy. You can have all the Carney acts in the world but we all want the Ocean Beach o Belmar! Go to the BEACH. I hope the mayor starts by first starting to adjust our bloated town salaries (except in one or two cases, no one in this small town should have a six figure salary) downward and getting rid of certain political appointees who never had any background in the depts. (get rid of some dept. altogether) they lead. Of course, we must understand taxes will have to be raised in order for our debt to be serviced and brought down. But this is what we voted for, or at least myself. As Reagan simply stated years ago, Mr. Gorbachev, tear down that wall! Can the new administration get rid of that unsightly, useless, temporary, man made dune???? 42. Lots of police salaries over $200,000 with their overtime! #42-Mr. Dilberger-You are on target with all of your suggestions! Couldn’t agree more! thing to do but the mentality was sick. #46…she was forced to follow orders given by someone else. MB collaborated with BA to torture a dying woman who only tried to help our borough by educating the public. It was a terrible thing to do but I wouldn’t call it torture. Also, nobody knew she was sick. It was a sick, sick trick and nobody deserved to be the target of such a despicable act. If they didn’t know she was sick they surely meant for her to be and it accelerated her anguish. End of story. Re; the MB vs CC port-a-potty. I spoke to Joy and Carmine persoinally the following day. They waved down golf cart with Mary B. and Colleen C. in it, the early evening that said port-a-potty was placed there. Both said Oh well and were reported laughing as they drove away. Sympathy for the “nice” Mary B.. I don’t think so. #53: that’s is my recollection as well. She’s nasty to Seniors as well. To the apologists of the members of the former mayor’s administration: face it, most were compromised individuals of some sort or other, following the leader, reluctant to give up their jobs, compromising any ethics they may have or have had. Probably, “nice people” until push comes to shove. My opinion, of course. This is why it’s time to get rid of them all and drain the swamp. #55…you have no idea the repercussions employees suffered if they didn’t agree with everything Colleen did or said. If they didn’t think like she did, something was wrong with them and were treated like garbage. It was the most unprofessional, dysfunctional atmosphere and I’m so glad it’ll soon be over. I only wish I was still there to enjoy and welcome the refreshing, much needed change that cant come soon enough. There is a remedy, it’s called “Whistleblowing”. Bridgette anyone?